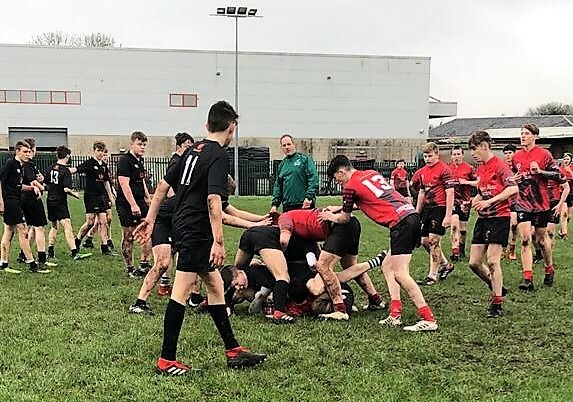 The Colts U16s lined out today in the hope of reaching the final of the league against a formidable Connemara All blacks side in the first of the semi-finals. 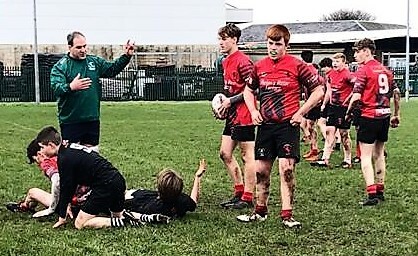 Right from the start of the warm up one could see that the Colts were up for this game and pity the side that were going to try and stop them from reaching this U16s side first league final. In ideal conditions for rugby the Colts decided to receive the kick off on a perfect pitch in Dunmore. Straight into attack mode went the Colts, and for the first 10-12 minutes they were repelled by a resilient All blacks side. The breakthrough came when a brilliant break by full back Joe Prendergast saw the first score on the board for the Colts, alas the conversion was not to be. Not long after that the All blacks Loose head had to leave the field of play after a collision and unfortunately for him the end his game. From a line out by the All blacks that should have been a Colts line out as the ball deflected of an All blacks player but was unfortunately missed by the linesman (Martin ahem!!) saw the excellent Nathan Moran steal the ball thanks to the superb lifting by the 2 Jacks (Gleeson/Kennedy) Nathan popped the ball to man of the match scrum half Micheal Hett who passed to MJ who’s quick hands released to John Wallace, with his speed and strength he peeled around the outside to score just left of the posts. Cool as you like up steps the Colts influential No.10 Kyle Leonard to slot the ball between the posts. The Colts started to take control of the game and this was in no short measure to the huge role that the forwards made. An All blacks line out 7 metres from the Colts try line, All blacks win it, 2 huge surges see the All blacks come within 2 metres of a score and just as they think they are over up steps the huge frame of Kieran Sullivan who single-handedly drives the All blacks No13 back half way to the Colts 22. In comes Luke Colleran to steal the ball, the Colts swift hands move the ball across the 22 line into the hands of Kyle Leonard who with a burst of speed runs the length of the pitch desperately chased by the All blacks. But Kyle would not be caught, and the try scored. Kyle absolutely exhausted after his excursion left the kicking duties of the conversion to Joe Prendergast who duly obliged. The All blacks just couldn’t cope with the speed and tenacity and sheer determination of this Colts side. Just before the half time whistle, again a fabulous break by Nathan Moran saw him come up just short of the try line but with excellent support from the Colts No2 Jack Gleeson, Nathan, as he was on the ground popped the ball into the hands of the charging powerhouse that is Jack Gleeson nothing was going to stop him and over he went for the Colts 4th try of the game. After regaining his breath from his earlier charge up the field, up stepped Kyle Leonard to slot over for the conversion. Half time. The Colts decided to make some changes and give some players a rest. Out came winger Jack Sheridan and was replaced by Jarlath Judge, next was Kyle Leonard replaced by Brian McWalters. This a luxury that the Colts could afford to make this early as their dominance was that good. If the 1st half was a feast for the Colts alas the second half was a bit of a famine. The All blacks pushed the Colts to their limit. An early yellow card for Michael Hett for deliberately going off his feet right in front of the Colts posts saw the All blacks tap the penalty when an easy 3 points were there for the taking. They were repelled by the sheer determination of a forward pack led by Jason Morley who was like Gandalf with the attitude of “they shall not pass!” The Colts could make little or no headway past the All blacks and they kept pushing for a try. 2 more kickable penalties were given up by the All blacks and again the Colts kept them out. A huge tackle from John Wallace drove the All blacks ball carrier back 15-20 metres. The All blacks just did not know how to deal with this sheer determination. Just as Micheal Hett came back on to the pitch again the Colts were down a man when Tight head Sean McHale was sin binned for a high tackle. Again the All blacks gave up the kickable penalty to see if they could score a try and once again the Colts pack repelled them. Another huge tackle from John Wallace saw the All blacks driven back twenty metres and their momentum gone. Changes were made due to the exertions of the players, Adam Gleeson on for Kieran Sullivan, Tristan “Disco” Diskin on for Jack Gleeson, Kyle Beirne on for MJ, Daniel O’Connell for Evan O’Brien, Owen Flanagan and Brian Bermingham were also introduced. All performed brilliantly. But there was to be a last score before the final whistle. Up to this the All blacks had kept the Colts from scoring. But finally, the break-through came and it was the Colts who scored, when replacement Brian McWalters got over the try line between the posts with the conversion coming from Joe Prendergast. Final whistle. Colts 33 All blacks 0. 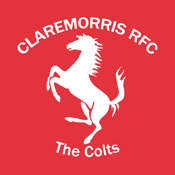 Colts U16s are into their first league final. 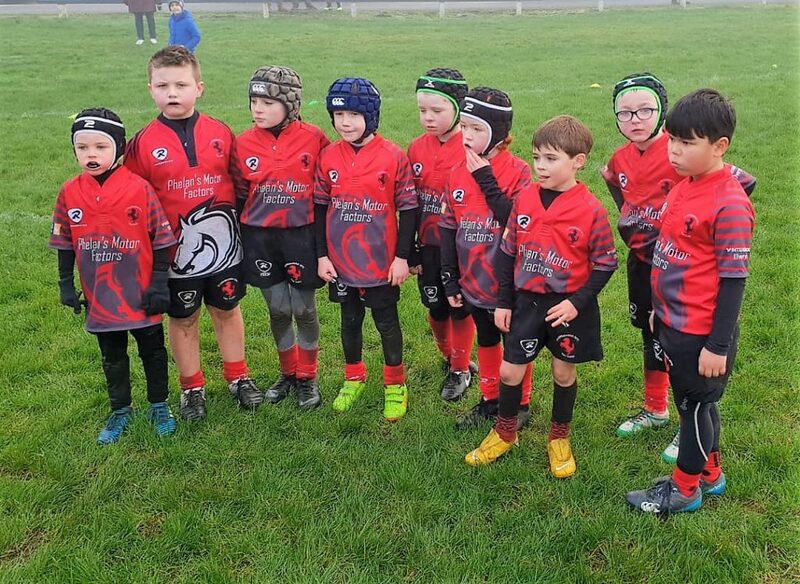 The Colts’ Minis performed exceptionally well last Saturday at all age groups. 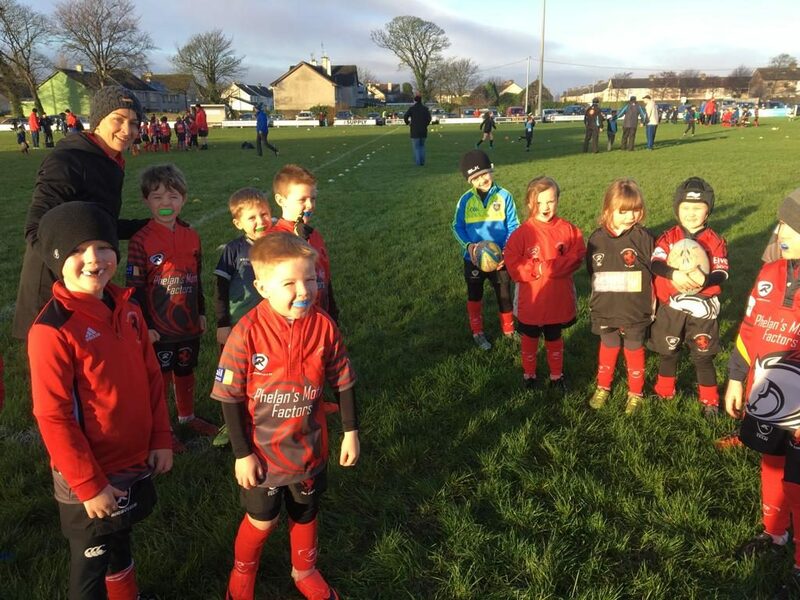 U8s team today out classing two very good Galwegians teams. 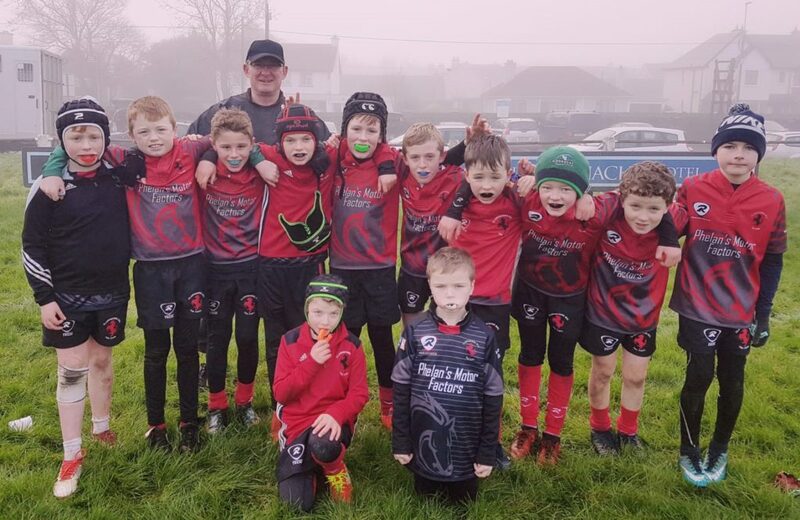 U9 boys did very well against tough opponents in Galwegians and Galway Bay, winning all three games and enjoying themselves. 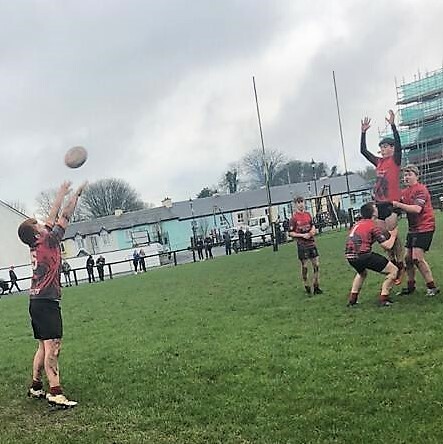 Colts U14s played their final league game in the pool stages away to Westport on Saturday morning. The game was a must win for the Colts to ensure qualification for the semifinals and this encounter promised to be a cracker with the two sides evenly matched in previous games. 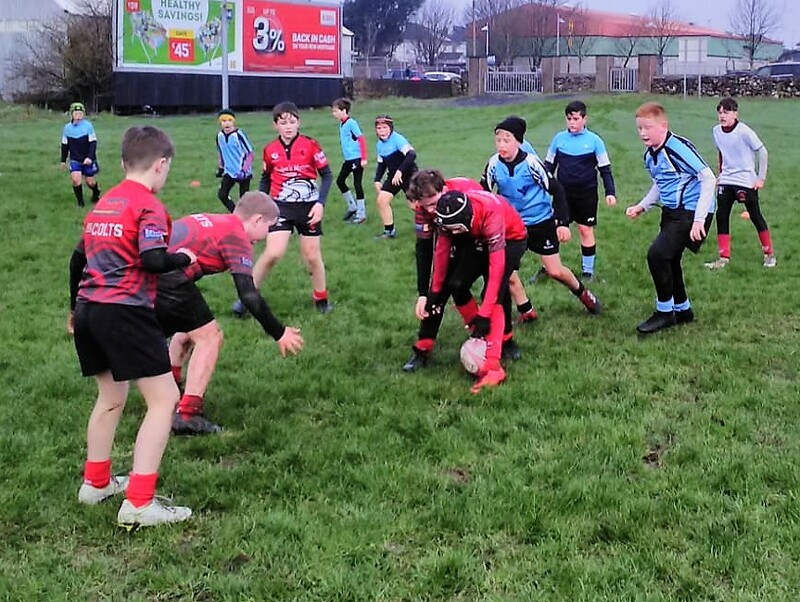 In perfect conditions for rugby and with a good number of spectators the game kicked off with the Colts’receiving and boy did they they hit the ground running . Full of intent they ran straight at the Westport defence and set a marker as to what the Covies could expect as wave after wave of pressure forced them back and with only a few minutes gone the relentless driving of Jack Cunningham saw him pump his way over the line to score the colts first. Straight from the restart the colts drove at the Covies again and with some fine display of handling the line was broken by Rio Mortimer to score number two. With the Colts now on fire and to hot for Westport to handle Mortimer was causing all kind of problems and touched down for his second. The Colts, now in total control, saw waves of attacks with Brian Hett reveling in the air and smiling for ear to ear as he carried the ball into contact as if it was just for fun. The ball scooped up by McDermot and with quick ball across the game line released full back Thornton at pace to score number four. Morris converted two to leave the score 24-0 at half time. Westport started brightly in the second half and a cry from the full back calling the Covies “to dig deep lads or we could be in for a right hammering here” saw them cross over for a try out wide. They failed to added the extras but their heads were up and they were here to play . Conditions were perfect on a fresh Winter’s morning for what was expected to be an epic battle and the big numbers of supporters that traveled weren’t disappointed. The game started at a blistering pace and the tackles and rucks were immense with neither side giving an inch. The Colts took advantage of some hard fought yards to go over for the first try but failed to convert but it wasn’t too long before Ballinasloe struck to leave it 5-5 at the break. The second half started off at the same frenetic pace where the first left off, with some promising line breaks but Ballinasloe were strong on the counter rucking which resulted in several turnovers and lost yards and it was Ballinasloe who capitalised with the next score with a scorching run down the wing. 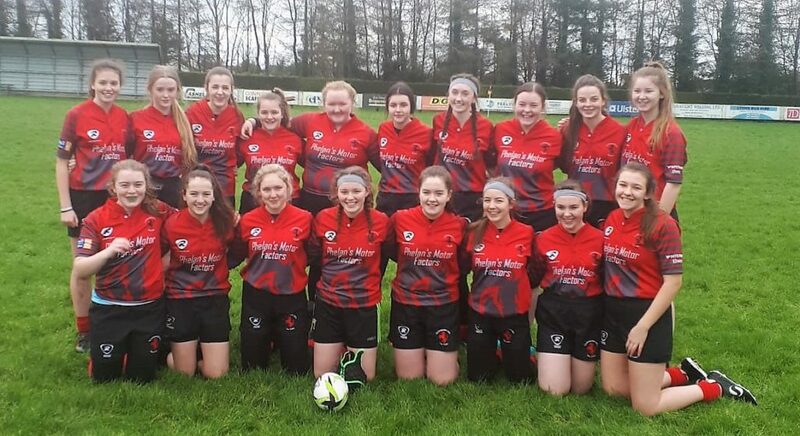 The girls battled till the very last minute and were unlucky not to get their just rewards when the ball was again turned over just shy of the try line before the final whistle blew leaving it at 10-5 to Ballinasloe. The U14’s travelled away to play Ballina in the first round of the cup.The girls showed some real grit and determination against a side that played on the edge if not beyond it at times and some crucial calls didn’t come our way,however they did cross the line with Alanah Fitzpatrick which was converted, but alas that was as much as the Colts could manage as Ballina ran out winners 15-7.A brave effort by the girls and a special mention for Isabelle Phillips who was tenacious in defence and was certainly in the running for player of the game.